One of my favorite games for the original Nintendo that I remember playing in junior high school is Duck Hunt. I still don't get all the critics who said the web was not "a good enough-for-now platform" to develop for the iPhone.... it seems that thus far the possibilities have been endless. 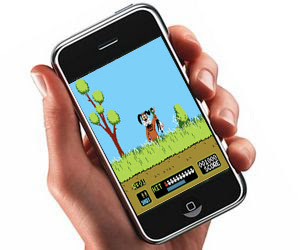 * You shoot by tapping/hitting the ducks with your finger.